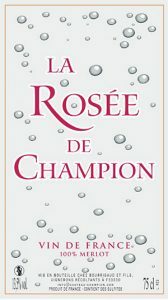 The Rosée de Champion is a fine rosé wine composed of 100% Merlot. This is a fruity wine which can be enjoyed as a pre-dinner drink as well as in accompaniment of salads, grilled meats or even pizzas. If you want to keep it fresh and conserve its flavour, you have to drink this rosé in the year. To be served chilled!